Ford, GM, Trabant, Yugo and even BMW all have models that rank among the 10 worst cars ever made. 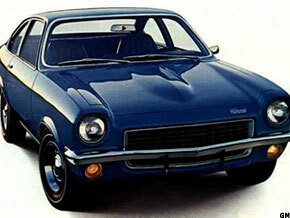 DETROIT MainStreet) -- For me, it is the Chevrolet Vega. I was living in Toledo, Ohio, in the late 1970s and working as a reporter for The Toledo Blade. One day, I was preparing to drive a friend's Vega. I sat down in the driver's seat and put my foot on the floor in front of me, about to step on the gas. And guess what happened? It's not a tough question if you were ever in a Vega. My foot went right through the rusty floor. And for the ensuing three decades, I have had my own story about the worst car ever made. Events like my Vega experience make a big impression on drivers, says Edmunds.com Editor-in-Chief Scott Oldham. "Everyone I know who had a Vega has a story like that," he says. "Even now, GM ( GM - Get Report) is still paying for the ill will towards the Vega. A lot of the people who bought Vegas won't buy a GM car, and their kids and grandkids won't buy GM cars either." Yet as bad as the Vega was, it is not the worst car ever, according to Edmunds.com. About two dozen Edmunds.com staffers spent a couple of months refining a list of the 100 worst cars ever. They started with individual lists of bad cars, compiled them and put the cars in order, accompanied by lots of discussions, emails and meetings. The Cutlass was once among the best-selling U.S. cars. In the late 1970s, GM decided to take advantage of its popularity and develop a diesel version. The 4.2-liter Olds diesel engine was sold only in the 1979 Cutlass. Unfortunately, GM hadn't yet mastered diesel technology. "GM was trying to market a technology that wasn't ready for prime time," Oldham says. "The cars never really ran properly. They were underpowered. They blew up. They broke. It was a warranty disaster for GM." The engine "reached 90 horsepower before shattering into shrapnel," Edmunds.com wrote. The failure of the Cutlass diesel "turned Americans off to diesel," Oldham says. "It is one of the reasons why diesel is still a bad word in this country." Capitalists aren't the only people who sometimes make bad cars. Edmunds.com calls the 1957 Trabant, a two-cylinder, two-stroke engine compact from East Germany, "one more reason why communism is evil." The car was common in its home country, given the lack of competition, and was sometimes exported. It was East Germany's answer to the Volkswagen Beetle, and in some ways it was comparable, with the major difference being that the Beetle was a worldwide success and the Trabant was a spectacular failure. "Over the years, the Trabant has become an underground poster child for bad global cars," Oldham says. "It was produced for a long time, but never got better, never embraced any technology improvements" despite 30 years in production. The 1982 Cadillac Cimarron was a symbol of what was wrong with GM in the 1980s, an effort to compete with BMW by redecorating the front-drive, four-cylinder Chevrolet Cavalier and calling it a Cadillac. Edmunds.com called it "a self-inflicted wound that nearly killed Cadillac." The car was an embarrassment from the start, Oldham says, and "the press was all over it." It underscored the difference between BMW and Mercedes, on the one hand, which understood what luxury car buyers wanted, and Cadillac, on the other hand, which did not. Cadillac "was on the downswing, almost to the point of extinction" until cars such as the CRS and SRX began to revive the brand, Oldham says. Now, Cadillac is trying to further redefine itself as a viable competitor with the ATS. Ford's ( F - Get Report) Edsel brand became a symbol of a manufacturer's failure to judge the market. Not to say the every Edsel was bad, but the styling wasn't what people wanted -- the marketing of a brand that allegedly competed with Buick and Oldsmobile was way off and the production was often flawed. Edsel was "the legendary flop of all automotive flops," Edmunds.com says. The 1958 Edsel Corsair "was rejected by the marketplace," Oldham says. "It was reviled for being unattractive, starting with an unusual vertical grill" and horizontal tail lights, opposites of what car buyers wanted. You simply cannot make a list of the top 10 bad cars and not include an Edsel. Saturn got off to a good start. Many reporters trooped to Spring Hill, Tenn., in the late 1990s as GM showed off the new symbol of its ability to compete. Every company with the slightest connection to Saturn felt it had something to brag about. But by the start of the millennium, Saturn needed to be refreshed. Unfortunately, it came out with the 2003 Saturn Ion. Oldham recalls that he drove one of the first Ions, at a GM press event. "I was astounded by how bad it was in every way. I said, 'I think this is the worst car I've ever driven and GM should be embarrassed,'" he recalls. "And history has proven me correct." The Ion was uncomfortable and noisy and production quality was poor. It was tough to drive and had "a stupid interior to match," Edmunds.com says. "Kick it and your foot could get stuck in the gaps between the plastic body panels." Moreover, the competition was extremely tough at the time because Toyota ( TM - Get Report) and Honda ( HMC - Get Report) had excellent products in the small-car market. The Ion "was far behind the competition on the day it was introduced," Oldham says. "It was the second-worst car of the millennium and was so bad it killed Saturn." Saturn, once an inspiring symbol of the U.S. auto industry's ability to compete with the Japanese, shut down in 2009. The Vega preceded the Ion as a symbol of GM's failure in the small-car market. It wasn't just the rust. The Vega had "an engine that couldn't hold oil in a car built with contempt for its buyers," says Edmunds.com. "It's the car that invited Americans to buy Toyotas and Hondas." Perhaps fifth-worst car of all time is too good for the Vega. Oldham expresses some sympathy for the automaker. "GM was running the world back then, but there was an oil embargo at the same time as there was increased regulation. It was a tough time for the automobile, a tough time globally. U.S. automakers weren't ready for the fuel crisis, and new safety regulations came in simultaneously. They had to build small cars that their hearts weren't in." "The Japanese were poised to pounce," Oldham says, and that is what they did. By the way, Oldham mentioned that John Pearley Huffmann, who wrote Edmunds.com's story on the worst 100 cars, is also a former Vega owner. "He wanted the Vega to be No. 1," Oldham says. "He said he had one and he could watch it rusting around him." The Serbian-made Yugo shows up frequently on worst-car lists. Edmunds.com ranks the 1987 Yugo as the fourth-worst car ever made, but Oldham says it was a contender for No. 1. "The Yugo was terrible in every way -- terrible quality, terrible performance, and it fell apart around you as it went down the road," he says. The 1987 Yugo was a Serbian-made version of the Fiat 127, under license from Fiat. For a time, it was sold in the U.S., with 141,511 sold here between 1985 and 1991 -- "a Serbian-made version of the Fiat 127 that couldn't possibly be as awful as its low price suggested," Edmunds.com says. "But it was!" Perhaps you did not expect to find any BMW products on this list. But BMW "built the atrocious, single-cylinder, 12-hp, one-door Isetta for 7 years," Edumunds.com writes. "The whole car was a crumple zone." Ranked as the third-worst car ever, the Isetta was in the running for worst ever. "It's such a ridiculous automobile," Oldham says. "It has one door, five horsepower and is very narrow in back, almost like a three-wheeler. We can't understand why anyone would want one." In particular, Oldham says, he cannot understand why the Isetta has become a collector's item that sells for around $50,000. Historically, the car reflects an effort by a German manufacturer to get back on its feet after World War II. "Fuel was hard to come in Germany at that time, and they made a very small, very economical car," Oldham says. The Mustang is an iconic car with a rich past, but Ford stumbled in 1974 and created one worthy of being called the second-worst car in history. Certainly in retrospect, the concept of a Pinto-based Mustang does not make a lot of sense. "The car was popular in its day, but it was almost immediately looked upon as a mistake for Mustang," Oldham says. "When you look back at Mustang history, which is very glorious, this car should not have existed and should not have been called a Mustang. It was not attractive, not powerful in the least and didn't measure up to its name." In Ford's defense, Oldham says, the 1970s were a difficult time for U.S. automakers trying to adjust to rising fuel cost, intensified regulation and tough competition from Japan. "Thankfully, Ford didn't turn away from what Mustang should be," he says. Our winner is not only extremely ugly, but also has a singular distinction: it destroyed an 84-year-old automaker. "Only hours before we went live with the list did we settle on where the top three would settle out," Oldham recalls. "We decided that none of the other 99 cars on the list had such a negative impact on such an established and successful brand. The Aztek became such a punchline for a bad car that Pontiac was damaged goods. After the Aztek, GM couldn't save Pontiac no matter what they did." The car is hideously ugly, Oldham says, adding: "The joke is that the styling is its best feature."